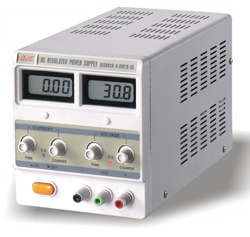 Power supply for electrolysis and other electrochemistry operations, with 1 output and 2 LCD screens. With micrometric regulation for electric voltage and current. Protection form short circuit, overload and over heating.